See scan - perfect condition. This is a ONE OF A KIND object. True Royal / Royalty regalia and symbol of the power and the head of country and State. This is King Ferdinand I Royal Prince / Princely scepter used for some ceremonies during theperiod of 1890 - 1908. King Ferdinand did not posses a crown or orb, since under the Turnovo constitution only an Orthodox Bulgarian King could receive Kingdom Royal regalia by the Bulgarian church AND Ferdinand was a Catholic. 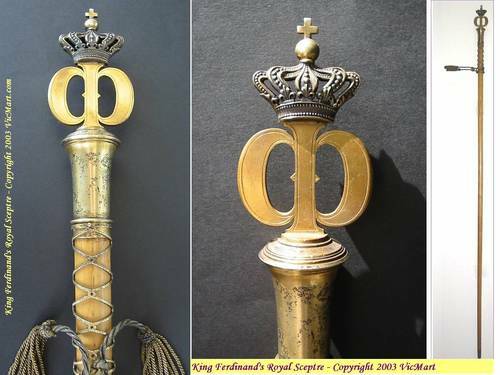 Nevertheless, during the time before he proclaimed himself King of Bulgaria in 1908, he used to have a Princely Royal sceptre and it is the one listed now for sale at VicMart. The sceptre's history is very interesting too. It was taken out of the Royal Palace in Sofia during the end of WWII when the communist partisan troops entered the Palace and looted and destroyed the majority of the Royal symbols and objects. One of these communists had taken the scepter along with the personal Great State Seal of the Secret Cabinet of King Ferdinand and kept those two pieces in secret for more than 50 years now. Relatives had provided it later on to VicMart. The sceptre is about 130 cm tall and since it was a Princely scepter it was made out of fire gilt / gilted sterling silver, silver thread and boxwood. The top of the sceptre is the Royal Hesse / Hessen type of crown on top of the Royal Ferdinand F monogram / cypher. Since it was not allowed for photographers to take photographs in the Palace or any of the Halls during ceremonies it is very hard to find a photo of Ferdinand holding the piece. Also, he was not keen on using it on the outside, since he was not really accepted yet by the Great powers during his Prince period of 1887 to 1908. Later on Imperial Russia, Germany, etc. accepted him and an ascension / accession ceremony took place in 1908. No one will ever find another Royal regalia or scepter for sale elsewhere. It is much rarer than any Royal decoration, order, collar or medal as it is supposed to be a piece given by God to the ruler of a State and symbolizing the Power and the King. There was only one case in Europe that an European Royal regalia was sold and it was sometimes during WWII when some of the Czech regalia was looted by the NAZI German Army and later on it was sold through an antique shop in Austria. The last time a Bulgarian Royal / Royalty objects were sold, was during 1997 at Sotheby’s auction when the WWII exile King / Tzar Simeon II of Saxe Coburg Gotha had sold many of his Grandfather’s King Ferdinand I order collection, which had many pieces in gold, diamonds and precious stones. Now Simeon II is the current Bulgarian Prime Minister. None of these decorations is anything special compared to the Royal scepter. VicMart gives a lifetime guarantee on the authenticity of this piece, as well as it will provide COA authentication certificates along with the object. Absolutely scarce and one of a kind Royal collector piece. Important object and a true gem for any museum or private collection.